The former Holy Angels Academy on Hertel Avenue in Buffalo. The hallowed halls of the former Holy Angels Academy building in North Buffalo will again be full of students, starting this fall. The Charter School for Applied Technologies will take over the vast, former all-girls Catholic high school. 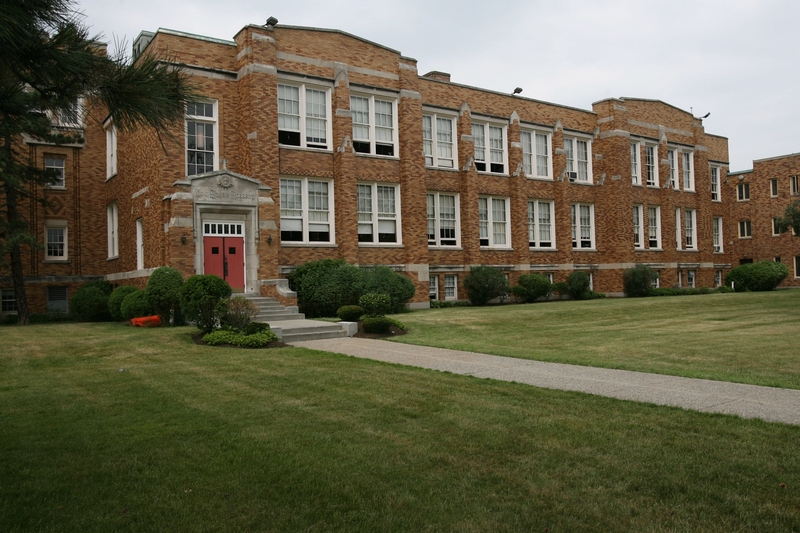 It will relocate its three middle-school grades from its Kenmore Avenue campus to the vacant Hertel Avenue building as it continues its rapid growth. Both the school and the building’s owners confirmed the move today. The Town of Tonawanda charter school will occupy the entire 75,000-square-foot building, which has more than 30 classrooms, a new library and auditorium, a new gymnasium and on-site parking. The campus, which is now jointly owned by McGuire Development Co. and Ellicott Development Co., is located on 5.37 acres at Hertel and Shoshone Street. The move to the new site was approved Monday by a key committee of the state Board of Regents, along with a 40 percent expansion of the school’s enrollment. Already the largest charter school in the state with 1,675 students from kindergarten through 12th grade, the Charter School for Applied Technologies will expand its program to add 264 students in September from its waiting list of more than 1,000. Those new seats will be in kindergarten, sixth, seventh, eighth and ninth grades. The charter school also expects to add 10 teachers next year. In all, over the next six years, through 2019-20, it will add a total of 690 students, reaching a K-12 enrollment of 2,365 on its current campus and at the Holy Angels site. The move and expansion is still subject to approval by the full Board of Regents next month. “Our administration and our teachers couldn’t be more excited about our move into the former Holy Angels Academy. The building is impeccable, it suits the needs of our students and our programs, and allows for future growth,” said J. Efrain Martinez, superintendent of CSAT. The school’s administrators hope the expansion will alleviate a long waiting list of students who have been turned down for admission to the career-focused charter school. Applied Technologies had 1,188 applications for 133 slots during its annual enrollment lottery earlier this month, Fetterly said. Applied Technologies currently occupies three Kenmore Avenue buildings near the city line in Tonawanda, with students from 19 different school districts. While about 80 percent of the charter school’s students come from Buffalo, the school is located within the Kenmore-Tonawanda School District and would continue to offer lottery preference to Ken-Ton students. The elementary and high-school grades will remain on Kenmore Avenue. However, the expansion would move some of the students into the City of Buffalo for the first time. Martinez said he expects that the sixth-, seventh- and eighth-graders will be able to move into the former Holy Angels building by fall. Martinez said school administrators had worked out the terms of a lease agreement for the former Holy Angels site with McGuire but were waiting until the state approved the school’s expansion plan before finalizing the deal. Dentinger said no decision has been made yet about whether the charter school will lease the school or buy it. “It’s certainly something we’re going to wrap up pretty quickly with the school,” he said. McGuire Development will now work with the charter school to get the facility ready for students by August, while also collaborating with Holy Angels Academy alumnae to preserve that school’s 152-year-old legacy and include its graduates in the building’s future. Dentinger said officials have been talking about how to incorporate the building’s past tradition into its future, such as with honorary plaques. “It’s their legacy, their building, and we don’t want to step all over it,” he said. Holy Angels had been a stalwart of the North Buffalo community and educational landscape since its founding by the Grey Nuns of the Sacred Heart. It closed abruptly a year ago because of declining enrollment and finances. Last-ditch efforts by parents and alumnae failed to keep it open. Ellicott Development’s Carl Paladino bought the building at auction last August for $2.9 million; the deal included major gym equipment, but not desks, chairs or library furniture. At the time, he indicated he planned to return it to educational use and said he had a tenant and plan in mind that he believed would be acceptable to the community. The building has largely sat vacant since then, aside from a short-term lease for the gym space by Nardin Academy. Then, in December, McGuire Development joined forces with Paladino, buying a 50 percent stake in the building and collaborating to market, lease and reuse it.